Sir Peter Paul Rubes was the most sought out figure during the Baroque period known for his richly emotional paintings and scholarly thoughts. He has worked on many different themes which can be observed through Samson and Delilah [religion], Saturn Devouring His Son [mythology] and Honeysuckle Bower [double portrait]. His works have influenced the world or paintings in an unparalleled manner and he is considered to be as talented as da Vinci himself. The painting Honeysuckle Bower was completed in the year 1609, the year in which Rubens got married to Isabella Brant. She was the first wife of Rubens and as mark of their unison, he painted the work. The painting is simple, presented with minute detail and has symbolic value also. It is oil on canvas painting and is an example of double portrait where the artist has a self portrait and a portrait of his wife. The painting is rich in color as well as detail regarding the background and the clothing of the pair. The couple seems to be posing for someone under a honeysuckle bower and the background is almost filled with it. The shrub is very well-grown and provides shadow for the married pair. One can identify the man as Rubens because of his popular self-portraits. Isabella Brant is portrayed with great happiness brimming through her cheeks making her smile benevolent. Rubens, on the other hand, seems to be seated with the support of a balustrade and is looking with full confidence. Both of them are well-recognized in the society one being a painter and the other being the daughter of Jan Brant [secretary of Antwerp]. Therefore, both of them are shown as noble individuals with elegance, chivalry and self-confidence. 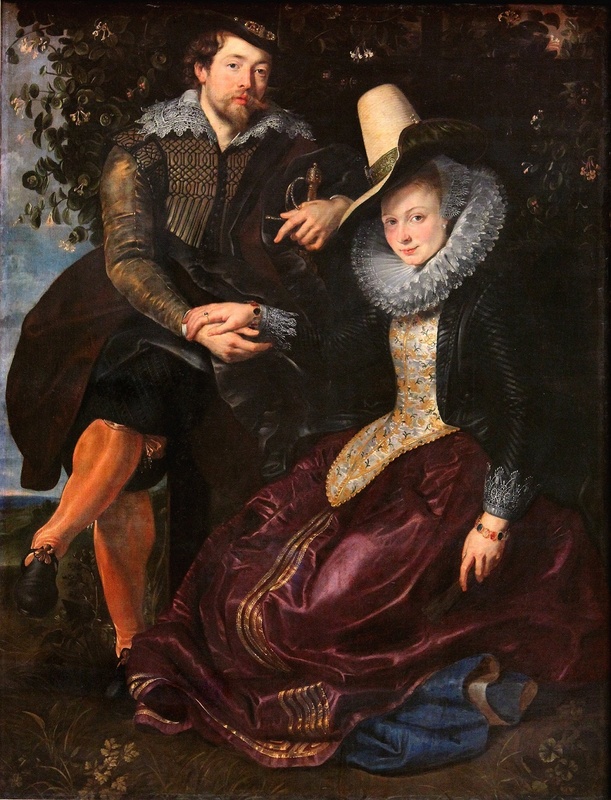 The sword in the left hand of Rubens, the fan held by Isabella Brant and the vibrant attires indicate the same about the couple. Their eyes are full of confidence and wonder, indicating that their expectations of their future are bright. The background itself is a symbol of love [Honeysuckle is considered a symbol for love] and their holding hands further emphasizes their love towards each other. Sir Peter Paul Rubens is known for his vast symbolism and creative interpretation of any subject; however, the Honeysuckle bower is done as a subtle piece of work rather than embedding too much intelligence. Everything in the painting is neat, blissful and reflects the love and anticipation of the couple after their marriage.